I've been using Veeam Endpoint Backup to protect physical laptops and desktops for my extended family since its release nearly 2 years ago, and recommend it to friends who are often former Windows Home Server fans. Yeah, VEB doesn't have central management, but it can email daily backup reports, backup to local drives, network shares/NASs, and/or B&R (Veeam Backup & Replication) repostories. It can also backup basic Windows Servers right up through Windows Server 2016. When bringing one of my sons back to college just last week, you can bet his workstation and laptop are VEB-protected with daily backups, to help reduce the threat from the likes of Cryptolocker. I even do an automated local and remote daily backup thing over a private VPN, but I'll tell you all about that another day. See also my list of recent Veeam articles below. That's the very same guy I had the opportunity to late night walk-and-talk with back at VMworld 2015. By chance, we had left Veeam's big party at the same time when I struck up the conversation with him, heading back to our hotels near Union Square together. The Free version will always be available, and will always be Free. Note, these agents will require the new Veeam Availability Suite 9.5 that's coming up in October, see also Free NFR of Veeam Availability Suite v9 with Backup & Replication for VCPs, vExperts, and many other certified professionals..
Based on new information, I've updated the title of this article. 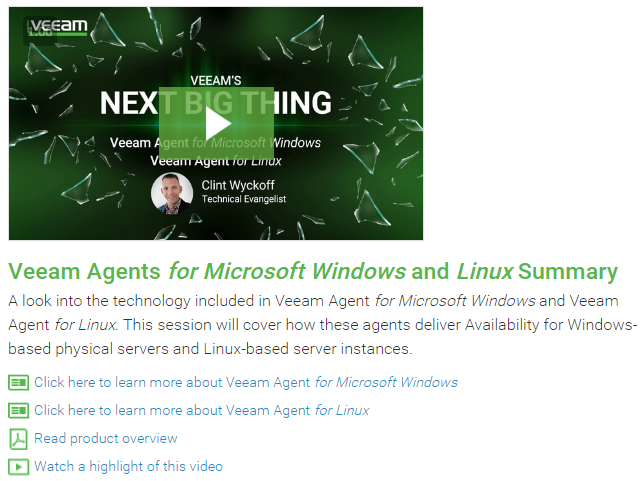 Q: Is Veeam Agent for Windows a brand new offering? A: No, Veeam Agent for Windows is the next version of Veeam Endpoint Backup. If not the name change, we would call it Veeam Endpoint Backup 2.0 – but we needed a more generic name to reflect its full server support available with the Server edition license. Q: Does it mean that Veeam Endpoint Backup FREE is going away? A: Two years ago, we said that endpoint backup must be simple and free – and we stand behind this statement! We will continue to provide free edition for Veeam Agent for Windows, and have no plans to discontinue this offering. There will be NO feature loss comparing to the current version of Veeam Endpoint Backup FREE 1.5 (if you see a feature loss during beta – it's a bug, so please report it). Moreover, this new version gets even more features: support for Windows Server 2016, much requested source-side encryption and optional periodic active fulls for better reliability of backups to a consumer-grade storage, and many enhancements as a part of core processing engine improvements. And through the integration with Veeam Backup & Replication 9.5 (including Free Edition), in addition to the existing application item recovery options, you get instant recovery to Hyper-V VM, and restore directly to Azure. 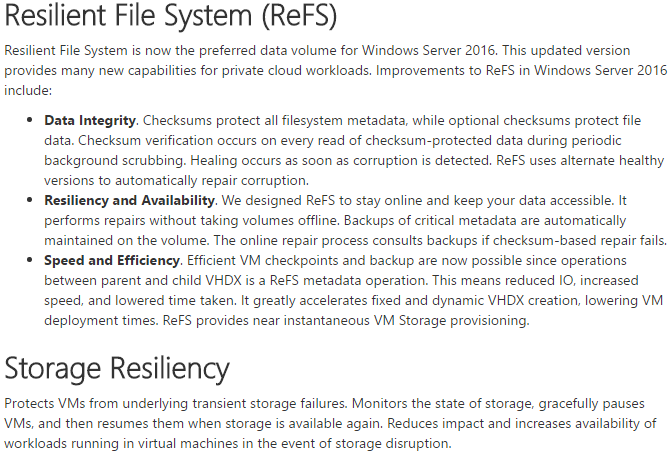 All of this is available with the free edition of Veeam Agent for Windows! Q: Why are you introducing paid editions of the Veeam Agents? A: The biggest feature of paid editions is 24.7.365 support (which also explains why we chose subscription-based pricing). Production support has been a popular demand from many customers who are not allowed to use free products with no support in their production environments, and we heard you! Additionally, paid editions bring a few additional features which focus on enterprise use cases (check out the corresponding breakout sessions linked above for details). Q: Will there be any changes in Veeam Backup & Replication 9.5 in regards to enhanced centralized agent management? A: No. Since Veeam Backup & Replication 9.5 will release much sooner than the Agents, integration level will remain as it is today for now. 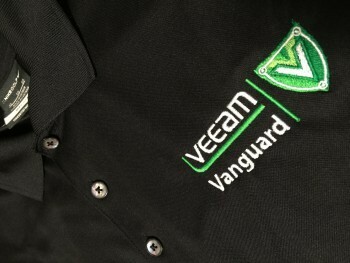 Q: How can the Veeam Agents be centrally deployed, managed and monitored? Under 10 agents: manual deployment and management is recommended. Above 10 agents: using remote configuration and management API available in licensed agents to automatically deploy and configure agents with logon scripts, Group Policy, SCCM, or whatever tool or method you have in place for software distribution is recommended. Hundreds of agents and multiple locations (hybrid cloud, remote offices, home offices, mobile users): Veeam Availability Console is recommended. Note that this is a short-term answer for the immediate future – we are looking at providing additional options down the road. All Veeam Endpoint related articles. Aug 23 2016 by Anthony Spiteri at Virtualization is Life!